Start by layering punchy text over a striking image. Feature a call to action, and include an interactive element. The way people consume content and interact with information online is changing rapidly. Rather than being passive audiences, social media users are now active participants in content creation, topic selection and even news gathering . Anyone with a smartphone and internet access can livestream events as they unfold. With the rise of Snapchat and Instagram, the Stories format has exploded in popularity. The vertical, left-to-right, easily digestible format has been adopted across a multitude of platforms. As of May 2018, an estimated 1 billion users are posting Stories each day across Instagram, Snapchat, WhatsApp and Facebook. Beyond that, from the second quarter of 2016 to the third quarter of 2017, Stories grew 15 times faster than feeds. 1. Start with a powerful shot. Just 65 percent of viewers who watch the first three seconds of a video will keep watching to the 10-second mark and beyond, and a mere 45 percent will stick around for 30 seconds. You have a tiny window of opportunity, so use a compelling visual to hook viewers right away. On Instagram, your task is to spark readers’ curiosity and encourage them to click through your Story. Snapchat is a little different. The Discover section can act as your headline, and you can launch into the story as soon as people tap in. Regardless of platform, a powerful visual with a catchy headline is a good way to start. 2. Layer on the text. Your Story should be understandable with or without sound. Text can emphasize certain points, add context or strike a mood. Use pull quotes to highlight a powerful statement. Above, National Geographic tells a story paired with breathtaking video clips. Also, let users know how long your Story is. This is illustrated at the top of all Instagram Stories, with a series of bars representing each slide. On Snapchat, publishers can create similar visuals. 3. Play around with visuals, polls and interactive elements. Keep your audience’s attention by making your Stories more interactive. Try adding layered visuals, appearing and disappearing text or animations. You can also tinker with interactive elements such as polls, quizzes and prompts to create custom content. 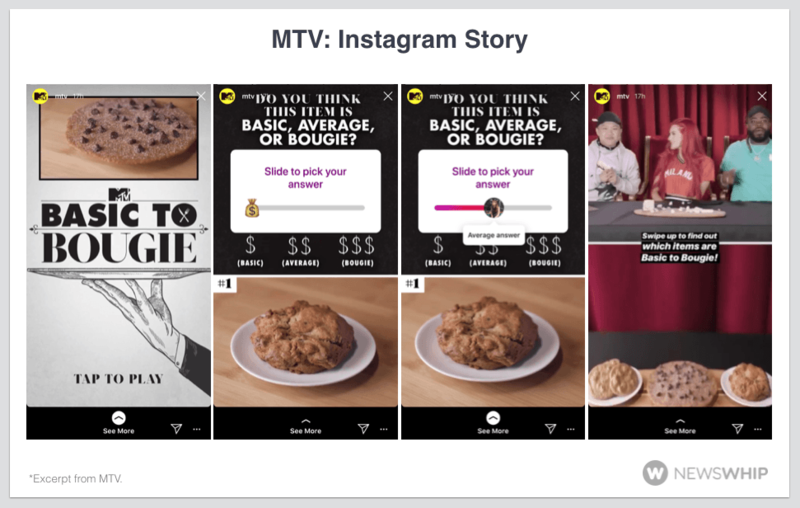 In this example from MTV, viewers are prompted to pick their answer to a question and see how their answer compares against average responses. 4. Add a clear call to action. Beyond just offering a fun storytelling experience, your content should lead users to do something. What is it you want your audience to do? Whether you want to direct users to different content, a newsletter sign-up, a sales site or another landing page, make sure your Stories feature a clear, distinctive and prominent call to action—on its own slide. Don’t neglect the storytelling aspect of Stories. The snaps or slides should flow and make sense as users click through, just as with a book or magazine. Make sure you have a strategy behind your Stories; don’t waste your time creating content that has no clear purpose. Stories offer a tremendous opportunity to connect with, educate and motivate your audience, but you must post pieces that resonate with your people. If your readers aren’t interested, it’s not worth the effort. Test different formats and platforms to reach your target audience in new ways. If you’re looking for ways to engage and entertain younger users, Stories might be for you. A version of this post first appeared on the NewsWhip blog .